Safe Web Security – can it crowdfund? I wanted to try it for a while – a crowdfunding campaign. The most important challenge for me was to write a story that would be easy to understand and sufficiently interesting for people investing in crowd funding projects. It was actually one of my new year resolutions and as I gave it a little bit of thought over Christmas I started working on it immediately. I have no idea if it’s going to succeed but I thoroughly enjoyed the creation of it. the most challenging was to create a decent video. I found an incredibly nice service Promo / slide.ly . I managed to create a mash-up video in about a day. The text of the campaign is all about safety. We are now in a situation where 75% of web traffic is encrypted. Which is great but it also means that there’s around 1 million of Let’s Encrypt certificates expiring every day. My point is that many don’t use encryption (i.e., HTTPS) for security but to be high in Google search. This creates a huge risk of services going down because someone forgets to renew a key or because something breaks down. With all the automation, many users got burnt last year, when Let’s Encrypt started using IPv6 as a default authentication method. Their websites showed IPv6 addresses but they were not properly configured. I have run KeyChest as a free service since August 2017 and it now has over 1,500 accounts, with the biggest account monitoring over 4,000 services. 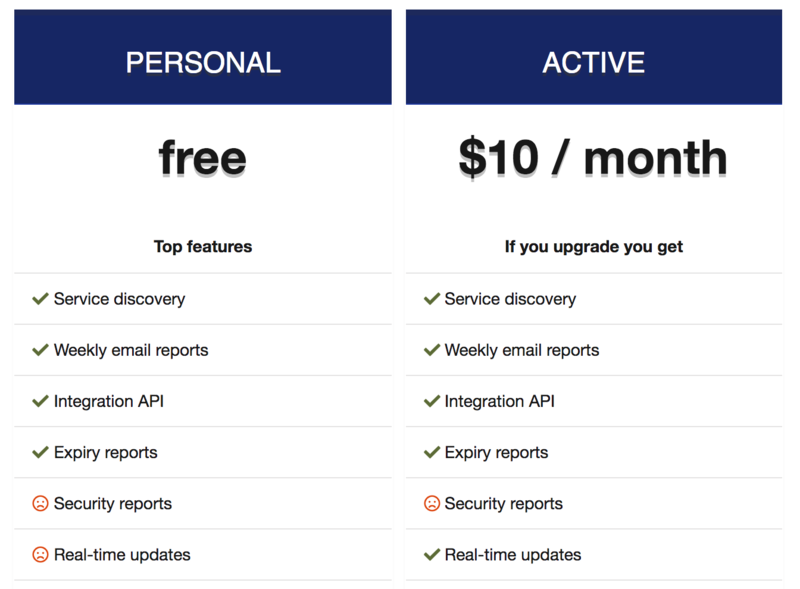 I want to keep it free but I also believe it has now features that justify a subscription model. A new version of KeyChest – with volume-based subscriptions offers real-time notifications (email, Slack), user management and improved reporting. It is still being stabilised, but the UI will start making use of much improved management options soon.